What do you need when you start playing the piano- or when you're ready to get an even better instrument? A pianist may not need so many gadgets and stuff as other instrumentalists, but we do need the best quality we can afford. There are a few "musts" as a pianist; a good piano and a comfortable piano bench placed in a comfortable and well lit area. Serious pianists also need a metronome. These are the "bare necessities" for pianists. 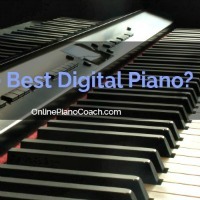 Here are guides that will help you to find the instrument that's perfect for you- whether it's an acoustic or digital piano, and a guide to why and how it's so important with a proper piano bench. As always I enjoy answering your piano playing questions, and this month you'll get some tips on how to practice not looking at the keyboard! Finally, free Ragtime music by the beloved King of Ragtime, Scott Joplin himself. 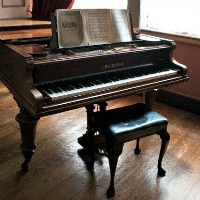 When buying a piano, the acoustic instruments usually come first to mind. 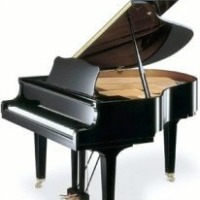 But what kind of models and brands should you look at, and what type of piano would suit your needs? Here are tips and advice for buying acoustic pianos. What to look for, think about and how to best take care of your instrument. Success with the new changes!! What are the best exercises for knowing the piano keyboard without looking? Can you suggest drills that will help me memorize the keyboard; that is, to know the keyboard without looking?? Although it may seem easy enough to memorize the touch and feel of the piano keyboard, many- many piano students struggle with the problem of looking down at their hands when reading sheet music. What makes this music so special is the syncopated rhythm combined with a “chopped” or "ragged", rhythm pattern in the bass. Here you can learn a little more about this style of music and print free sheet music!